CorreTrak provides a suite of mobile touchscreen applications that streamline correctional facility operations and improve compliance. Specifically designed for the specialized needs of jails and correction agencies, CorreTrak offers advanced inmate tracking and management capabilities for inmate identification, rounds and well-being, head count, program attendance, and cell check. CorreTrak can be integrated with your existing Jail Management or Records Management system or can be run standalone using advanced web-based reporting. CorreTrak is designed to integrate with your Jail Management System (JMS) by automatically synchronizing important inmate information, such as booking data, mugshots, permanent housing assignments, inmate alerts, and facility locations. Data captured using CorreTrak is wirelessly synchronized to the Jail Management System (JMS) for supervisors to review in real-time and generate custom reports. Most inmate tracking devices are unable to transmit data unless they are physically attached to a PC which can cause delays for receiving crucial, accurate data in the Jail Management System (JMS). 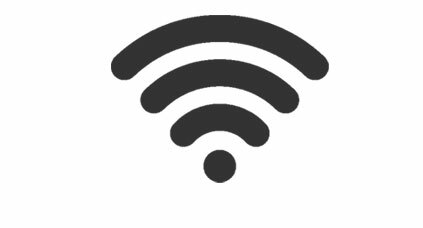 CorreTrak was engineered to intelligently synchronize data whenever a wireless (WIFI) connection becomes available, allowing officers to continue with their handheld operations, even during periods of no wireless connectivity. CorreTrak is designed to be flexible yet affordable and supports scanning either traditional barcodes or contemporary QR barcodes. Either barcode types can be scanned on inmate wristbands, ID cards and rugged tags mounted in key locations around the facility. CorreTrak includes several Web-based reports so officers can quickly access real time scan information and export to popular file formats like Microsoft Excel and Word. Reports can be filtered by officer, location, date, time, booking number, and even be configured to be automatically emailed to supervisors at the end of a shift. Perform full inmate head counts using wristbands and ID cards or simply enter the total number of inmates for a particular location using the touchscreen. Counts are synchronized to the Jail Management System and web-based reports can be generated by location, date, time, and officer. 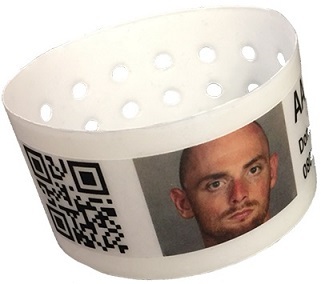 Record where an inmate is located in your facility by scanning wristbands or ID Cards. Scans are synchronized to the Jail Management System and logged by date, time, officer ID, booking number, and inmate name. Record an inmate’s observed activities, behavior and demeanor, while performing cell checks. 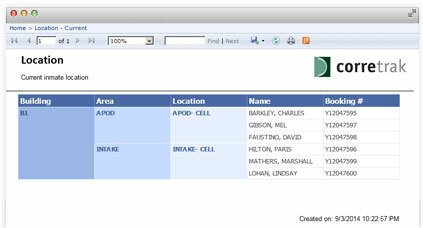 Cell Checks are synchronized with the Jail Management System activity logs and can be reported on by date, time, officer ID, booking number, inmate name, and location. Record inmate program and class attendance using wristbands or ID cards. Program attendance logs record the instructor ID, inmate check in and check out times as well as update the inmate’s location within the Jail Management System. 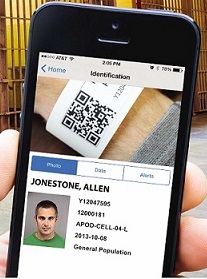 Positively identify inmates on or offline using inmate wristbands, ID cards or by entering their booking number. View customizable inmate information cards that include mugshot photos, name and demographics, housing, classification, and inmate alerts. Record detailed facility Rounds and Well-Being checks by scanning barcode tags mounted on cell blocks, individual cells and other key locations around your facility. Rounds are synchronized with the Jail Management System activity logs and can be reported on by start date/time, end date/time, officer ID, and location. With the introduction of BLE iBeacon devices you can be certain your officers are physically present at the facility and cell locations you define.